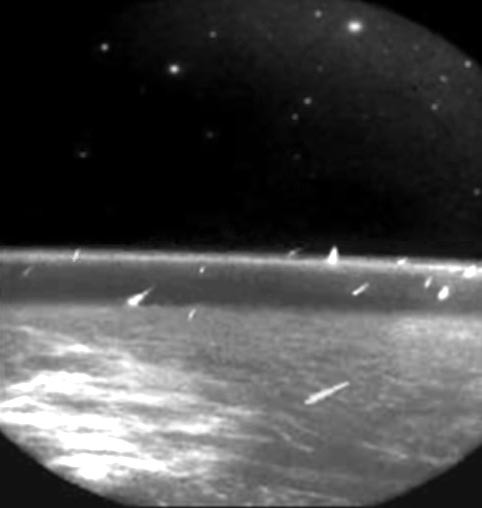 Explanation: Here is what a meteor shower looks like from orbit. 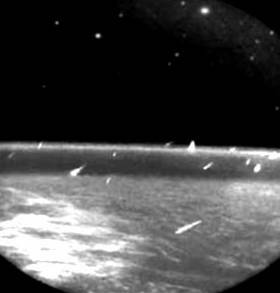 During the peak of the 1997 Leonid Meteor Shower, the MSX satellite imaged from above 29 meteors over a 48 minute period entering the Earth's atmosphere. From above, meteors create short bright streaks. Visible beneath the meteors are clouds lit by reflected moonlight, while visible above is the constellation of Aries. The directions of the meteor streaks are nearly parallel, confirming that the meteors all originate from the same meteor stream. Recent analysis of the 2000 Leonids meteor shower indicates to many astronomers that the 2001 Leonids may develop into a real meteor storm, with meteor rates perhaps exceeding one per second visible from parts of Asia.